Of the many native red grape wines recently revived in Italy, Sagrantino, the main grape component in Sagrantino di Montefalco - Umbria's flagship wine appellation - is one of the most distinctive. With its impressive complexity and longevity, it has the qualities to become the region's most famous wine, despite the fact that this low-yielding Sagrantino grape makes up a mere 6% of Umbria's total wine production. Sagrantino of Montefalco has one of the lowest maximum yields at 48 hl/ha, and must be aged for 30 months pre-release, of which 12 months must be in wood - increasingly French barriques. It is garnet-red with muscular tannins and full body, a subtle scent of violet petals, an aroma and bouquet reminiscent of blackberries. Montefalco Rosso is an earlier drinking blend of Sangiovese (60-70%), Sagrantino (10-15%), Cabernet Sauvignon, Merlot (15-30%). 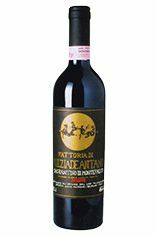 The Sagrantino grape reaches its apogee as a passito style wine, produced from partially dried grapes: full-bodied, mellow, spicy, with robust alcoholic strength of over 14 %, and a garnet red colour. The trend towards dry/Secco wines has only outstripped the sweet over the past 15 - 20 years. No shrinking violet, the product of Umbria’s central, land-locked position, baked by the sun, cooled by clay soils. It’s hedonistic but refined; not an extracted brute, but finely poised, thanks to the great vintage, with rosemary, herbal intensity, of Christmas tea and dried black figs. Suave, supple, sensual, tightly coiled, there’s more wild loganberry about the palate. Immense yet well-tailored. The essence of Umbrian Sagrantino. 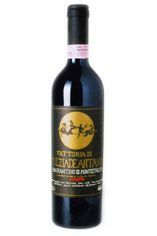 The Milziade Antano family has been associated with the Umbrian story of Montefalco and its Sagrantino grapes since the beginning. Initially as sharecroppers, then landowners and now bottling the wines under their own label. Umbria’s riposte to Veneto’s Recioto della Valpolicella: it’s opaque, with bright, fresh, graphite and blackberry fruit aromas, sweet but neat. Succulent, mulberry and brambly sweetness, crying out like a weepingly ripe blue cheese. It’s Port-like (but without the fortification), yet all the while light on its feet and agile. For those with a sweet tooth.